The November 7th elections proved to be a major victory for Democrats all around the country. Major stories centered around the gubernatorial victories of Ralph Northam in Virginia and Phil Murphy in New Jersey. Their large election margins are a positive sign for Democrats around the country, signifying momentum against the Trump administration. But big stories can also be found in smaller races. 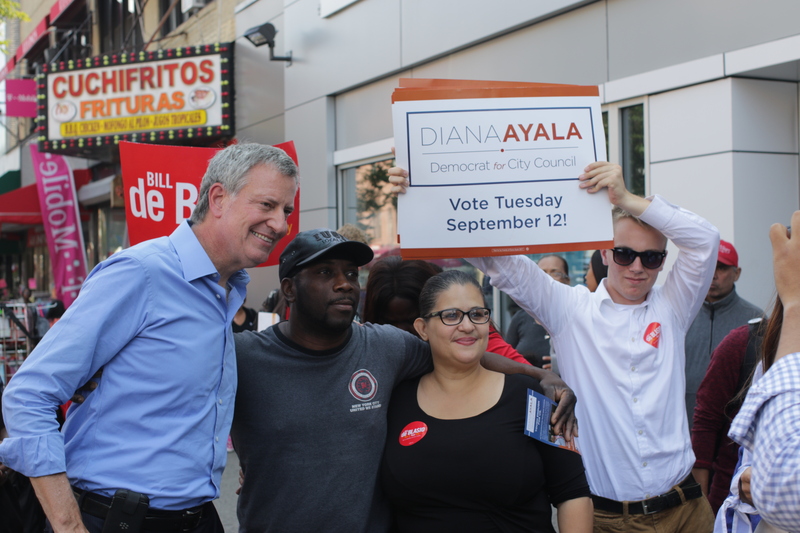 This summer I had the privilege to work on the campaign of Diana Ayala for New York City Council. She ran to replace the current Speaker of the City Council, Melissa Mark-Viverito, in District 8, which covers East Harlem and the South Bronx (one of two city council districts, out of 51, that covers two boroughs). I had not met Ayala before I started working for her, but over the months leading up to the election, I grew more and more impressed. Born in Rio Piedras, Puerto Rico, Ayala moved to New York City and grew up in the Lillian Wald houses, just across Houston Street from BHSEC. Ayala had her first child as a teenager, but during her pregnancy the father of her child was murdered in a senseless shooting. She entered another relationship shortly afterwards, which proved to be abusive. After surviving this, she moved into a shelter with her child. Ayala then enrolled in Bronx Community College where she graduated with a degree in Human Services and then worked in East Harlem at a home for senior citizens. The office of Councilwoman Mark-Viverito noticed her people skills and offered her a job as the head of constituent services. She excelled at this and was promoted to deputy chief of staff. Mark-Viverito was termed out after 11 years of dedicated service and unable to run for re-election, so she selected Ayala to run as her replacement. As a migrant, a teenage mother, a product of public schools, public shelters, as someone impacted by gun violence and domestic abuse, Ayala has overcome many obstacles to have the character and experience to hold the office of City Councilwoman. Ayala’s September 12th primary race ended up being one of the closest in the city, with only a 122 vote lead over her competitor, State Assemblyman Robert Rodriguez. As a second-generation assemblyman, he had name recognition in East Harlem that gave him a leg up in the race. At every chance, he labeled Ayala as an inexperienced newcomer to public office. These attacks highlighted his own ignorance and lack of preparedness to hold the office. Not only did he ignore the obvious gender disparities in the city council (5 of the 13 women in the city council were termed out, and only 4 were running to replace them), but he failed to recognize the necessary characteristics of a representative. As a republic, we elect representatives who can understand our daily struggles. Wearing a suit in Albany for six years does little to give you a real understanding of the people of your district. Clearly not all state assemblymen are out of touch, because I know some who are amazing community leaders, but for Rodriguez to discount Ayala’s years of community service was offensive. Ayala stood strong in the face of these attacks and fought her way through a difficult campaign. As the results came in on November 7th, I watched anxiously to see news about District 8. I knew victory was all but guaranteed because she was running against a Republican with little support, but I still wanted to see Ayala become official as a city councilwoman-elect. My own city councilman, Brad Lander, was running unopposed, and I was also keeping an eye on the 43th District, where Justin Brannan beat his Republican opponent by just under 900 votes. But for me, the happiest moment of the night came when Ayala won the general election with over 90% of the vote. In an overwhelming victory, there was no question that good things were coming to District 8. I recently noticed a movement on social media to label November 14 as “National Run for Something Day”. In the face of attacks on our democratic institutions, a campaign has emerged to encourage more people, especially women, to run for office. While this movement centers around those who have not worked in politics before, Ayala should be celebrated as a successful example. As a people person who had no ambition for higher office, she ran to advance progressive policy in City Hall. She wanted to keep streets safe and rents affordable for residents. And now, as a soon-to-be City Councilwoman, Ayala will be on the front line of every fight that reaches her district. Having overcome so many personal struggles, she is focusing on the struggles of her whole community.